Adrian Woj was a busy man, today. Chase Budinger has reached agreement on a three-year, $16 million deal to return to Minnesota, league source tells Y! Sports. The Wolves re-signed guard/forward, Chase Budinger. Not inevitable, but also not unexpected. A solid move. The Redick Dream was dead barely before it started. In moves that had Rick Adelman’s prints all over them, the Timberwolves retained one former Houston Rocket while plucking another away from Oklahoma City just a couple of hours later. We’re mostly familiar with Chase Budinger and leaguewide fans pretty much know who Kevin Martin is. With that in mind, I’ll cut to the chase; namely, what these deals do to the salary books. Back in March I took a close look at the Wolves salary-cap situation and projecting what may or may not be able to happen with free agents Budinger and Nikola Pekovic. With that work still saved in Microsoft Excel, it’s easy enough to plug in these updates. No additional trades are made. Nikola Pekovic, The Godfather, is re-signed for the same contract offer that Nicolas Batum received from David Kahn, last summer. While this is impossible to know, I think Pek’s deal will be in that neighborhood. Ricky Rubio signs a maximum extension in the summer of 2015. Kevin Love opts in for 2016. While this is unlikely, any extension that he would sign would approximate the same salary for that season. The bigger question is whether there would be another increase in 2016-17 and beyond if and when he opts out and re-signs. The Wolves are obviously going to be over the salary cap for each of the next three years (in this scenario) as well as the fourth in the event Kevin Love stays. 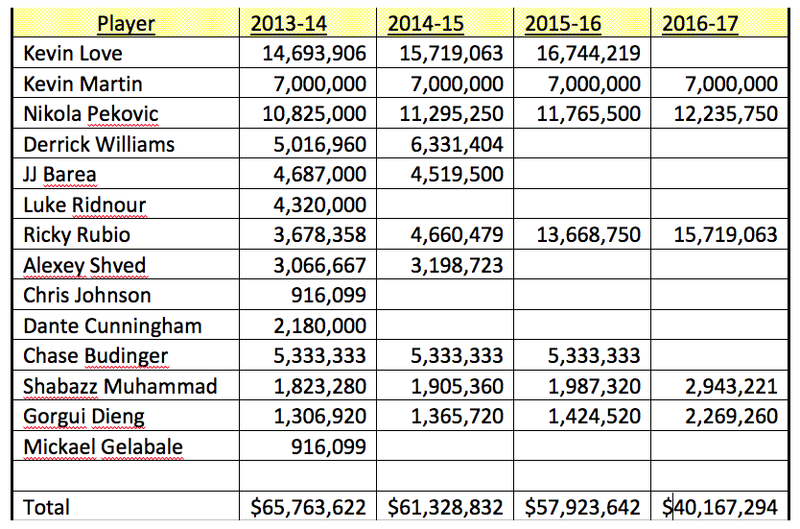 So the exactly salary-cap figure is not very important, if the team keeps the Rubio/Love/Pek core together. The luxury tax line is very important — assuming, anyway, that Glen Taylor isn’t going to go FULL PROK on the NBA anytime soon (he won’t be). Luxury tax for this upcoming season is projected to be $71.6 Million. Unless I’m missing something here, the team should have little trouble re-signing Pekovic and staying under the tax line. Considering that the tax line is expected to increase to $75.7 Million in 2014-15, that season shouldn’t be a problem, either. You’ll notice the number of players decreasing over time, with the total salary staying roughly the same. That’s obviously because it’s highly concentrated in a few players. It’ll be important for the team to creatively fill out the roster over time with a renewed supply of cheap labor. The best way forward, in the short term? Trade Derrick Williams for an expiring contract and draft picks. Don’t worry about the value of the player. Just get more picks; preferably ones in the first round or early second. The Wolves already owe theirs to Phoenix next year (lottery protected) so they’ll want to make sure they have one coming back to get a cheap player that can play some minutes in 2014-16. Anyway, some scattered thoughts on the Wolves’ cap situation. I like the Budinger and Martin moves. The Wolves — much like last pre-season — very much have the outline of a playoff team, with veterans who know what they’re doing surrounding Ricky, Love and Pek. Now they just have to SIGN PEK! But he still has two more seasons to go. I’d say the odds are quite good that he’ll be maxed out. Barring something unforeseen, there’s no way the Wolves will let him leave as a restricted free agent. Curry had severe ankle problems that called into question (still do) what type of career he’s going to have. If Curry were an RFA now, he’d easily command a max salary. That was lucky timing for GSW. Trade Ridnour and Williams for draft picks, use the 9M cap space to resign Kirilenko.